My ‘I want that bag! CAL’ is finished. I am SO happy with the result, just look at it! 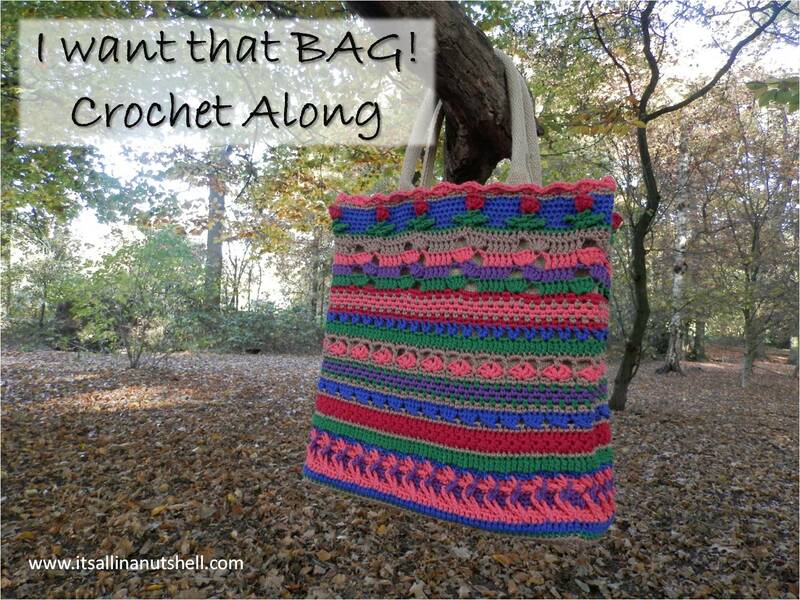 It’s no longer a case of ‘I want that bag’ but ‘I have that bag’ 😀 It’s a combination of wonderful Scheepjes yarn and a great design, you just can’t go wrong. I will be taking this bag with me everywhere I go, stuffed with more wonderful crochet projects. Color chart I want that bag! I used Scheepjes Bloom in the colors Azalea (426), French Lavender (402), Violet (403), Tulip (406), Geranium (408) and Dark Fern (411) with a 5mm crochet hook to make my bag. In my color chart I tell you exactly which color I used where. I used 2 skeins each of Azalea and French Lavender, and one skein each of Violet, Tulip, Geranium and Dark Fern. Off course you also need a jute bag. Scheepjes Bloom yarn and the jute bag are available from Wool Warehouse and many other Scheepjes stockists. I took my bag out for a small photo shoot in the woods close to my home during a wonderful warm autumn day. I love being outside and my boys love running in the woods, another win-win situation. It was great to wander around, not be in a rush, stopping to look at something special or nothing in particular. You know, just stopping to smell the roses, or in this case, feed the horses. If you want to make a bag of your own your can find the original pattern on Ravelry. I also have a full set of instruction videos to help you every step of the way. If English is not your thing I also have a Dutch translation available for you. This was a wonderful project and relatively quick to make. I hope you love your bag as much as I do and I hope to see you again soon for a new project. Kimberly’s website, justagirlandahook, no longer exists. Where can I find the pattern for the “I want that bag” Cal? Ravelry directs folks back to Kim’s website but as I said the site doesn’t exist anymore! I don’t know. I have the videos still available if that is any help? The pattern is now available as a free download on Ravelry. I’m wondering if anyone has put a lining onto the bag? And if so , do you have any tips? Thanks. Esther, thanks so much for your wonderful videos, I could not have made one without them. 💗. I only have six rows to go and then I will post on ig.